A family saga: four generations of mixed-race African American, Native American, and Irish women experience intergenerational trauma as well as the healing brought by nature and music, leading to triumphant resilience. Mostly White begins in 1890 when Emma, a mixed-race Native American and African American girl, is beaten by nuns and confined in a closet for speaking her language at an Indian Residential school in Maine. From there, a tale that spans four generations of women unfolds. Emma's descendants suffer the effects of trauma, poverty, and abuse while fighting to form their own identities and honor the call of their ancestors. 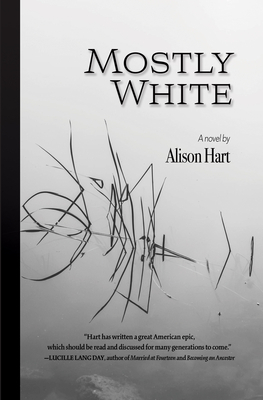 Alison Hart studied theater at New York University and later found her voice as a writer. She identifies as a mixed-race African American, Passamaquoddy Native American, Irish, Scottish, and English woman of color. Her poetry collection Temp Words was published by Cosmo Press in 2015, and her poems appear in Red Indian Road West: Native American Poetry from California (Scarlet Tanager Books, 2016) and elsewhere. Hart lives in Alameda, California. Alison Hart studied theater at New York University and later found her voice as a writer. She identifies herself as a mixed-race African American, Passamaquoddy Native American, Irish, Scottish, and English woman of color. Her poetry collection Temp Words was published by Cosmo Press in 2015, and her poems appear in Red Indian Road West: Native American Poetry from California (Scarlet Tanager Books, 2016) and elsewhere. Hart lives in Alameda, California.